I got up Sunday morning, super excited to make my sourdough bread. divide off 3.5 ounces for sour to keep for next week. knead for 5 minutes in a bowl as it’s pretty sticky. let rest at room temp 67 degrees. 30 minutes later, I kneaded for 5 minutes. The dough seemed to want to come together, but the more I kneaded it, the more it fell apart. 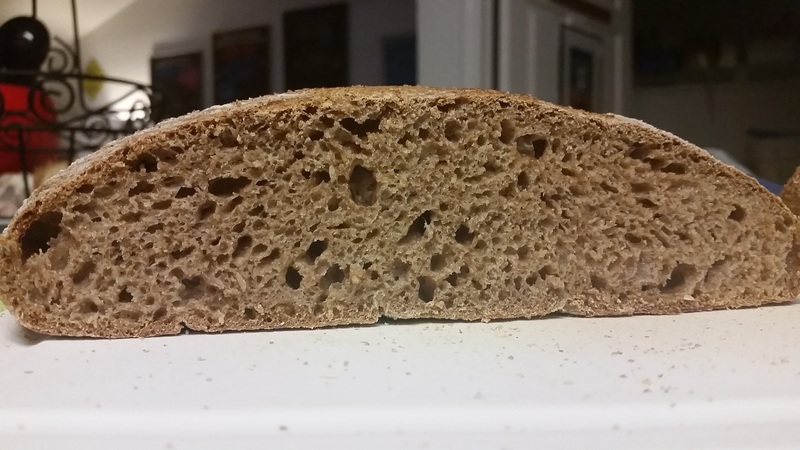 This whole wheat flour has a lot of sharp shards of grain in it (stone ground) so kneading might be doing more harm than good. It didn’t seem to want to form gluten so that is why I chose to knead it again. Decided I would let it set for 30 more minutes and go back to the turn and fold method for the next two hours. And then I got busy doing other things. And then I forgot to heat up the oven. And then I decided to bake some oatmeal for the week. So, it’s been almost 4 hours. oops. Well, nothing ventured… nothing gained. It was too wet, that was obvious as soon as I put it on the peel. Where it promptly stuck and…. flattened out.. double oops. After fussing with it and fighting with it and finally getting it scored and off the peel, I stuck it in the oven. In the oven at 425 degrees for 20 minutes. bread, bread baking, sourdough, whole wheat. Bookmark. I’ve never tried it with bread, but rice flour works very well on a pizza peel. Looks good.